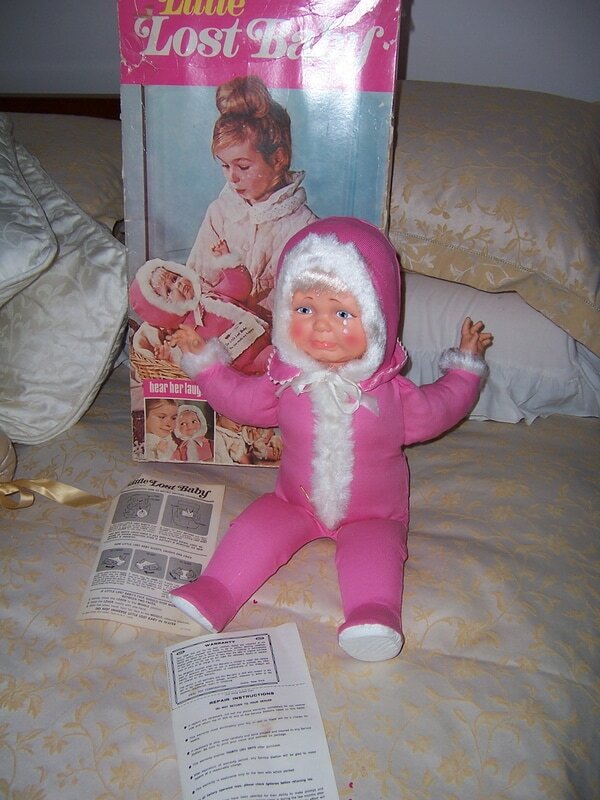 This gorgeous doll is a very collectable Ideal doll from the 1960's - Little Lost Baby. We even have her original box. A lot of the dolls of this era were battery operated and they talked, cried etc but as time has progessed it is very unusual to actually find one which works completely. If one is working then it has generally been to the doll hospital and been retwigged. Our doll is not working, and it appears one of the battery connections has broken off. Little Baby Lost is meant to cry with the sad face, and laugh with the happy face when you push the white lever at the back of her neck. It is operated with a "C" battery. We have also been lucky enough to come across a copy of the original instructions for this beautiful doll i for you. Perhaps you will be able to get her to work. Her face moves to the 3 different positions very easily and she is so cute. Her face and hands are made of hard vinyl, her body and arms are stuffed and have a soft feeling, and her legs have a pliable plastic feel and are hollow when pushed. She comes in a pink one piece outfit which does not come off, and is trimmed with white fake fun fur around the hood, sleeves and down the front. The bottom of her feet have a white vinyl soles. This cute little doll looks like she has lived in her box for the past 40 or so years and is very clean. The lid of the box has been retaped It is in almost complete condition but there are some parts which are missing. The graphics and printing as still very bright and colourful.